What Day Of The Week Is June 29? 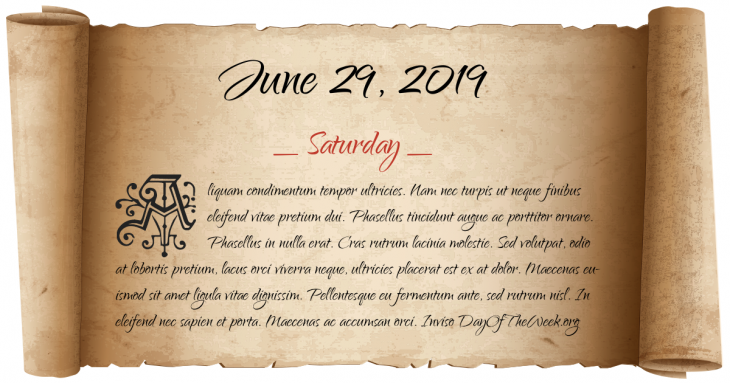 June 29, 2019 is the 180th day of the year 2019 in the Gregorian calendar. There are 185 days remaining until the end of the year. The day of the week is Saturday. Sverre is crowned King of Norway. Jacques Cartier is the first European to reach Prince Edward Island. The Globe Theatre in London, England burns to the ground. George Edward Gouraud records Handel’s Israel in Egypt onto a phonograph cylinder, thought for many years to be the oldest known recording of music. First test of Wallace Turnbull’s controllable pitch propeller. Carpathian Ruthenia is annexed by the Soviet Union. Who were born on June 29?